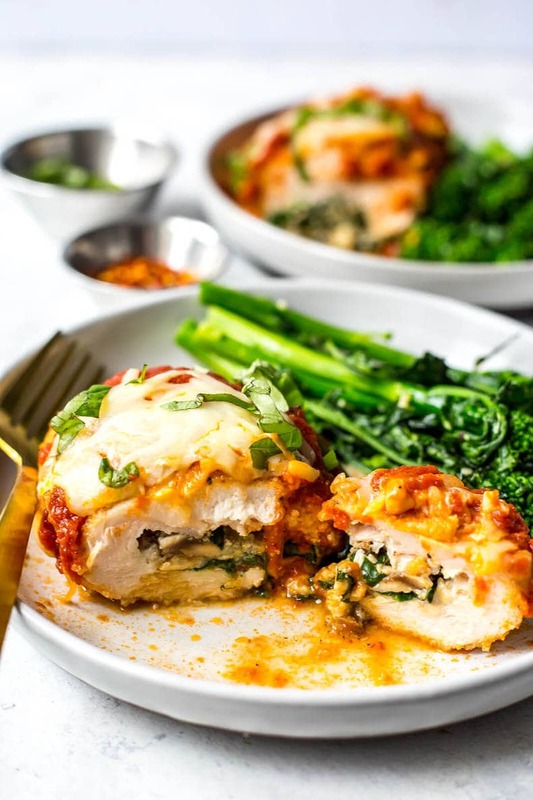 Say hello to one of the most delicious baked stuffed chicken breast recipes! These Easy Spinach Stuffed Chicken Roll Ups are filled with ricotta, mushrooms, sundried tomatoes and mozzarella cheese, then topped with breadcrumbs and marinara sauce - they are the perfect chicken dinner! Preheat oven to 400 F. Grease an 8x11 baking dish with 1 tbsp of olive oil and set aside. Add egg whites to a large bowl and breadcrumbs to another large bowl and set aside. In a large mixing bowl, mix together ricotta, 1/2 cup mozzarella cheese, mushrooms, sundried tomatoes, spinach and 1/2 tsp salt and pepper. Season chicken cutlets with salt and pepper. Lay each cutlet flat and fill with a thin layer of ricotta-spinach stuffing mix. Roll up chicken cutlets, then dip in bowl of egg whites, then bowl of breadcrumbs. Add each chicken roll up to the greased baking dish and bake in the oven for 25 minutes. Remove from oven, top with marinara sauce and cheese and bake another 5-10 min until cheese is melted. Garnish with basil (optional) and serve with your choice of green (I roasted a bunch of broccoli rabe with 1 tbsp of olive oil, a pinch of salt and two cloves of garlic at 400F for 10 min). Enjoy!